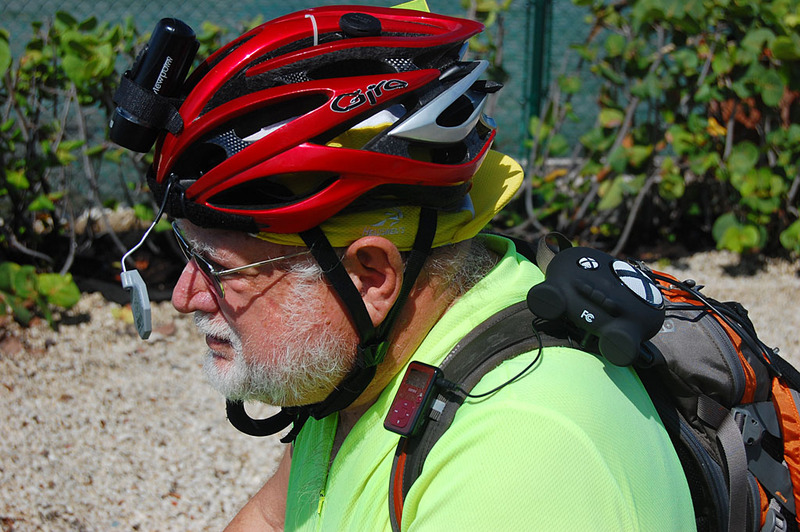 Christmas season is coming up, so here’s where you can get your BoomBotix BB1 Portable Speaker for your favorite cyclist (even it that’s you). If you click on that Amazon link, you’ll get it quickly and I’ll get a tiny piece of the action at no additional cost to you. Commercial’s over. I wouldn’t link to it if I didn’t like it. My old favorite – the Active Tunes i-Ride Pro – has had customer service problems and may even be out of business. Their website appears to be down. Based on my last experience and customer complaints I’ve received, I can see why. The vendor had problems with his Chinese suppliers, then he had serious family health issues that took priority. I guess it got too be much for him. My next email to Lief was a little more positive: “Second gut reaction: I’m more impressed than I was when I opened the box. My kid came over tonight and I was showing it to him, saying that I thought I was going to have a tough time writing a favorable review. Then we plugged it in. Very acceptable sound. Better sound than the Active Tunes speaker. In fact, I had to frisk him when he left to make sure it stayed here. The power switch and and Up and Down volume control buttons are located on top of the unit. There’s an LED on it to let you know that it’s on. It blinks when charging and is steady when it’s topped off. The back has a very sturdy metal clip. There are two rubber-covered jacks under the clip. One accepts a standard 1/8″ audio plug; the other is to plug in a USB cable to charge the battery. It’s claimed to be water resistant (and I believe them). Recharge time is supposed to be about 45 minutes. I didn’t put a stopwatch on it, but that felt about right. When I read the specs, it said battery life was four hours at full volume (3 watts rated / 5 watts max). That was a major drawback to my iPod Classic. Until I got an external battery, the unit would die before I did. Lief told me that four hours was a conservative estimate. Being a “trust, but verify” kind of guy, I wanted to see if that was true. Unfortunately, the next few rides I did were with a partner and I generally don’t play music when I’m riding with someone. I DID go on a Tuesday night ride and played it for about 30 minutes when I was by myself. On Thursday night, I decided to ride again. When I grabbed my Camelbak, where I have it clipped, I noticed that the power LED was glowing. Bleep, I thought. It’s gonna be dead. To my surprise, it was still going strong at the end of the evening. Another battery question for Lief: “When the battery starts getting low, does the volume start to drop or does the sound quit abruptly? I almost always ride with a Camelbak M.U.L.E. I’m not entirely sure if I buy all that “Hydrate or Die” hoopla, but, after a couple of bouts with kidney stones, I DO believe in “Hydrate or you’ll be wishing those pain pills were stronger.” It’s also a good place to hang stuff like the BoomBotix BB1. I thought this mounting position would work great, but it turned out that it put the speaker behind me and was just tall enough that it blocked my Hubbub helmet-mounted mirror. There’s a place on the Camelbak strap that holds the speaker where it is close enough to my ear that I don’t have to have the volume turned up too loud and it doesn’t interfere with my view to the rear. I wasn’t happy with the MP3 player just clipped on to the side of the strap, so I took a piece of Velcro strap and put it around the backpack strap so that the Sansa Clip would mount vertically and more securely. (This photo shows the Clip before I used the Velcro strap.) This position would allow me to adjust the volume on the BB1 easily, but I tend to do that directly on the MP3 player. Is there a bike mount? What if I don’t ride with a hydration pack? Is there a bike mount for it? 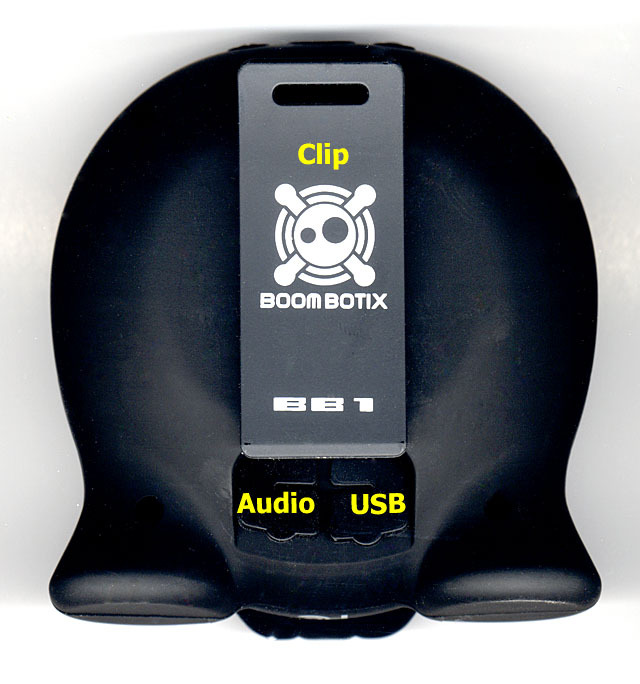 Well, there has been one promised for a long time, but this blog post from the BoomBotix folks explains they’re having trouble getting one they want to sell. I’m pretty sure I could rig a way to hold it on my bike using that nifty Velcro strapping mentioned above. I like their approach to customer service. They’ve been very responsive to me and they seem to be on the ball in talking about their product and stumbling blocks encountered along the way. I don’t find their website the easiest to navigate, but sometimes I’m flying in the fog with all the instruments spinning, so I hesitate to put all the blame on them. Again, here’s the Amazon link for the Boombotix BB1 Portable Speaker. What are those other things hanging off you? I’m a gadget freak. Hold on a day or so and I’ll post a list of some of the stuff you see in the photo, where you can get it, and any reviews I’ve done. 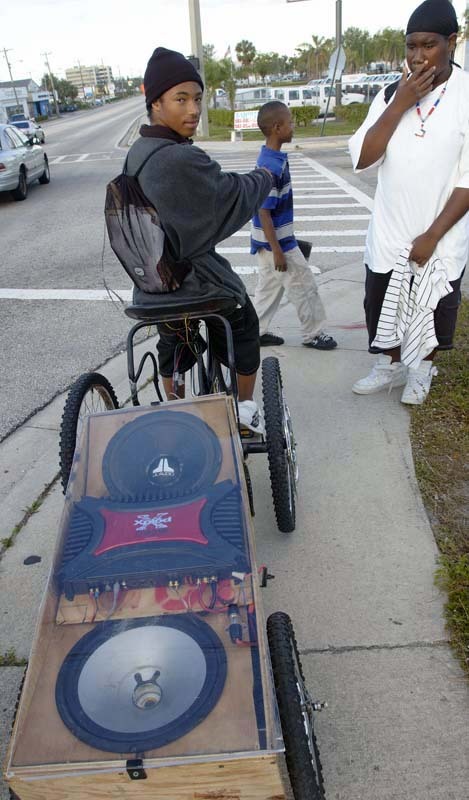 As far as I can tell, the i-Ride Pro is no longer available. Based on the number of complaints I’ve received and from my own experience, I have to withdraw my endorsement of the product. The Active Tunes website is down, so they may be out of business. 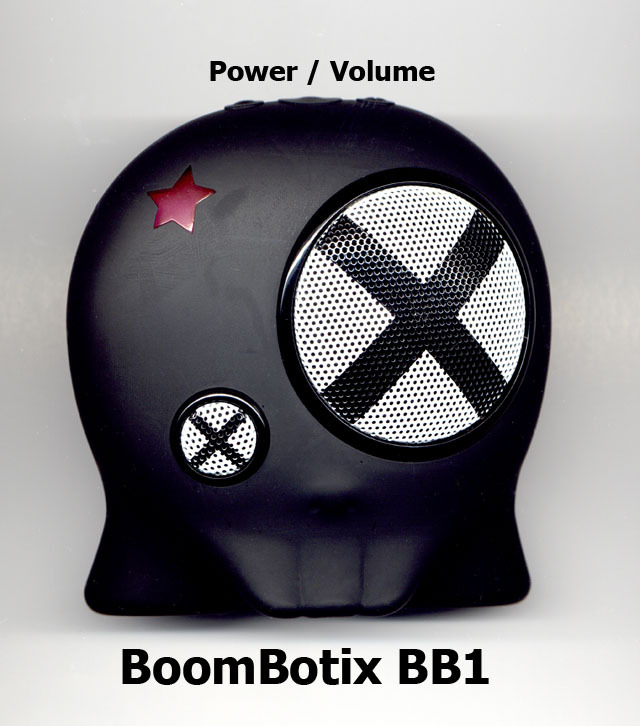 You can read my review of the BoomBotix BB1 here. I’ll leave all the other info in place for historical purposes. I still LIKE the i-Ride Pro, I just can’t recommend that you try to buy one. Too bad. 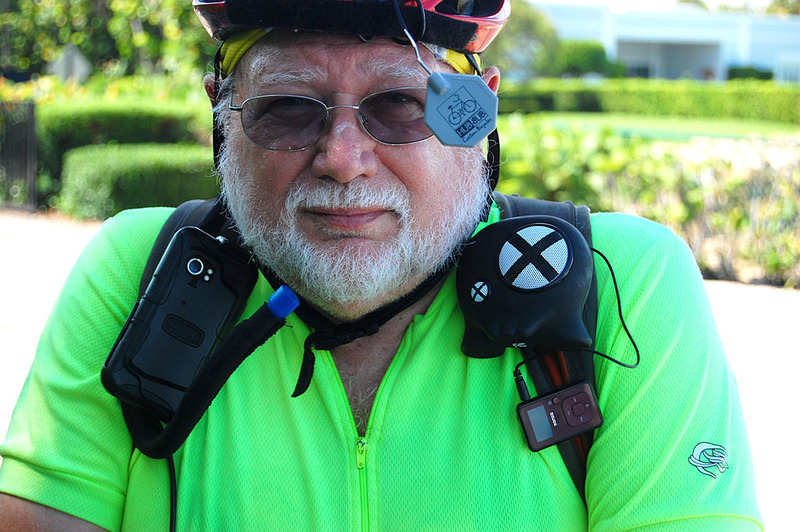 I finally found an MP3 speaker that works well on my bike. No, it’s not the one Son Matt saw on the way to work a few years back. Even I’M not prepared to carry a boom box so big it has to have its own trailer. I’m going to award the It Really Works Trophy to the i-RIDE Pro from Active Tunes. I’ll detail the als0-rans tomorrow and the next day. I’m going to have to set expectations here. I’m not an audiophile. Most of my life has been spent with multiple police scanners blaring stuff like, “One Adam 12, see the woman…” into my ears. That means the speaker has to be just good enough for me to recognize the song over wind and traffic sounds. Why Do I like the i-RIDE Pro? It’s small, 4″ x 1.75″. It produces acceptable quality sound with 4 watts output. The built-in rechargeable Lithium Ion battery has long life and recharges from a USB port. If you don’t have a computer with you, you could use a USB adapter (not included) to charge it from AC. Active Tunes says it’ll play for eight hours on a charge. I went for a four-hour ride on a Sunday and forgot to turn it off. On the next Wednesday, I noticed the LED was lit and turned the MP3 player on. Much to my surprise, the speakers still worked. Mick from Active Tunes says the battery should last for about 3,500 hours. If it fails within the first two years, Active Tunes will replace it free. If you play it while riding four hours a day, 365 days a year, then it should last 2.57 years. I think something better will come along before I need to replace the battery. 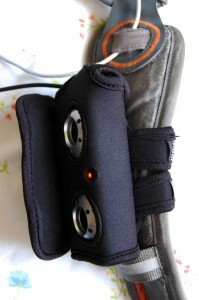 It comes with a carrying case that uses Velcro straps for multiple mounting possibilities. The case has a built-in MP3 player holder with a transparent front so you can manipulate the controls. What nits can I pick about the i-RIDE Pro? It uses a Lithium Ion battery that’s not removable. If it dies while you’re out on the road, then you’re out of luck until you can charge it again. The case’s MP3 player holder is designed for the newer, smaller players. My Classic is too big to fit it, so I cut it off. How do I mount my i-RIDE Pro? My Surly Long Haul Trucker’s cockpit is a bit busy, so I attach the speaker to my Camelbak MULE strap and put the iPod in a special pocket made for it. I use the iPod’s remote control to skip tracks, pause and adjust the volume. Since the speaker is right under my ear, I don’t have to turn the volume up very high, which probably gives me longer battery life on both the player and the speaker. The flap-looking thing at the left of the holder is for the smaller version of MP3 players. I cut it off after the first ride. You can listen to all of the speakers here, including on the road. They’re nice folks who have always been responsive to my email. You can find them here. Tomorrow I’ll review my second and third-place speakers choices, the Byco WRX1 and the Active Tunes i-RIDE Classic.